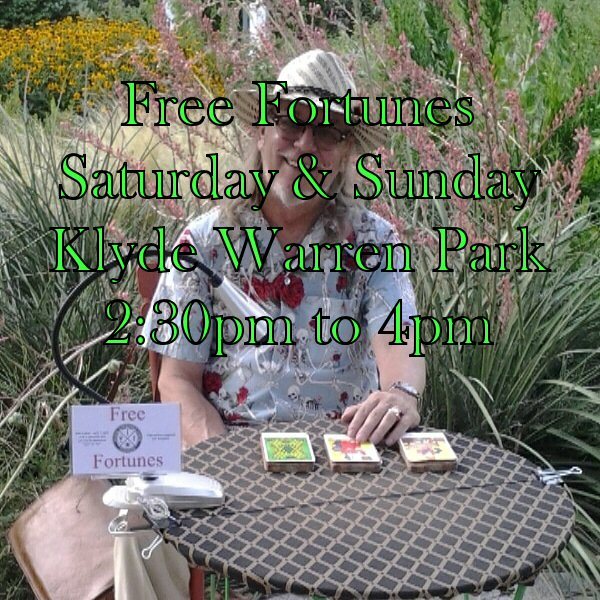 If you're here because you followed a link for tickets to the fortune teller in Klyde Warren Park let me apologize, there is no physical ticket. Your visit to the fortune teller is entirely free. However, if you read on, this is the ticket to getting the most from your visit. 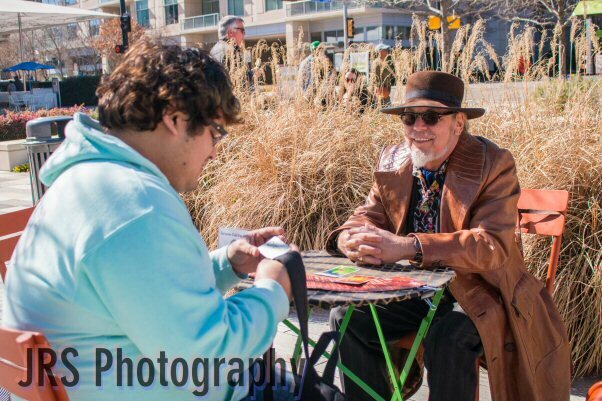 I am Major Tom Schick and I am the fortune teller in Klyde Warren Park. Since I started telling fortunes in the park back in June 2016, and I've told more than 2000 fortunes in that time, nearly every fortune told is about the present and not the future. This is simply the natural result of consulting an oracle without a question. Your question is your ticket to getting the most from your visit to the fortune teller. Here's how it works: When you approach the fortune teller he will bid you pick a card. Hold your question in your mind for a moment as you pick your card and show it to the fortune teller. You don't have to tell him your question. He will answer based on the card you pick. You might want to record what he says – it might not make sense until later. The kind of question you ask matters. Your question should be an open question, that is, a question that cannot be answered yes or no. How disappointed would you be if your reading consisted of a single word? Don't ask a question containing the word 'should'. Any fortune teller worth their salt will not make value judgments. Only you can decide what you should do or what is right and wrong. The best questions are about achieving a goal you have in mind. Let me give you an example. For many young people a common goal is to find a significant other and start a family. So do not ask, “Will I find my significant other?”, a closed question that can be answered yes or no. Ask, “What can I do to find my significant other?”, an open question that will give you a practical answer. So there you are in the park and it's your turn with the fortune teller and you panic because you aren't sure your question is right. It's ok to ask the fortune teller to help you word your question. He'll be happy to help because asking the right kind of question is the ticket to getting a good reading. If you really can't think of a question, the fortune teller will ask one for you. Page last updated 30th October 2018.